As the realisation of urban projects is most often preceded by a long planning stage, urban (re)development areas frequently appear to uselessly lie in wait during certain periods of time. This can however have a negative impact on their environment. Moreover the presence of “useless space” is almost unacceptable, taking into account the strong demand for open and public spaces. This article describes how the current study “The role of temporary use of waiting spaces in urban (re)development” examines if temporary use of these areas could contribute to a more contemporary, flexible and spontaneous approach to urban development. More specifically 10 case studies are described in which the present situation and the existing opportunities for temporary use in the concrete context of the Brussels Capital Region have been explored. The objective is to put the possible role of temporary use in the urban planning of the Region on the agenda. In this way, the present contribution joins other current initiatives, such as the organisation of the symposium “Tijdelijke Publieke Ruimte Tussen Flexibiliteit en Planning” and the master class on “De Uitdaging van Tijdelijke Publieke Ruimtes” of the ]pyblik[ platform in September 2013. 1In contemporary post-industrial societies, urban planning often involves unpredictable or uncertain situations. This implies the realisation of projects is often preceded by consultation, negotiation, concept design and planning stages, before the realisation can even start. 2Meanwhile the (re)development areas concerned appear to uselessly – from the perspective of the current economic space cycle – lie in wait, abandoned by their previous users, maladjusted to the present-day wants of society. They are neglected by the usual urban actors and remain un- or underused. Especially in urban environments – where social changes pre-eminently manifest themselves and are confronted with the inertia of the built environment – one will always find a number of (large or small) spaces “in transition” or “temporarily out of use”. 3These vacant areas have a negative impact on their environment. They attract undesirable activities, such as illegal dumping and vandalism, and create an impression of neglect, causing negative feelings with the neighbours. Moreover the presence of apparently useless spaces is unacceptable, taking into account the strong demand for open and public spaces where people can meet, express themselves and participate in the life of the city. 4The study “The role of temporary use of waiting spaces in urban (re)development”1 examines how a temporary use of vacant areas could contribute to contemporary urban (re)development. 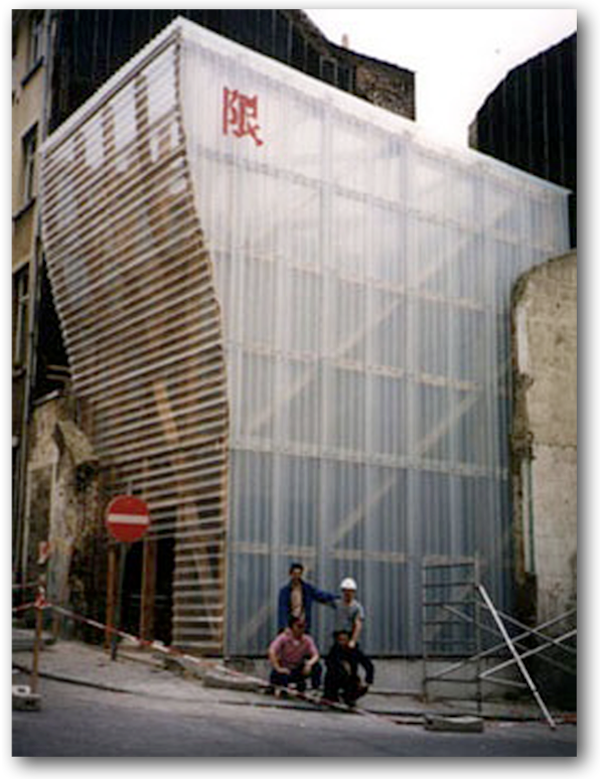 “Temporary use” means the use – whether or not directed or planned – of an urban space, anticipating a “permanent” use of the space in the medium or long term. Can urban transformations be initiated, influenced and/or guided by a temporary use of vacant urban areas? The role and significance of these areas in the urban fabric are examined, together with the expectations regarding temporary use and the tools that are available or can be developed. 5The study is both theoretical and practical. On the one hand, the characteristics and significance of urban vacant sites are explored through a literature study. This is combined with a comparative study of a number of alternative urban initiatives which, among other approaches, explore temporary use as an answer to challenges in contemporary urban (re)development2. The methods used are document analysis, interviews and study visits. 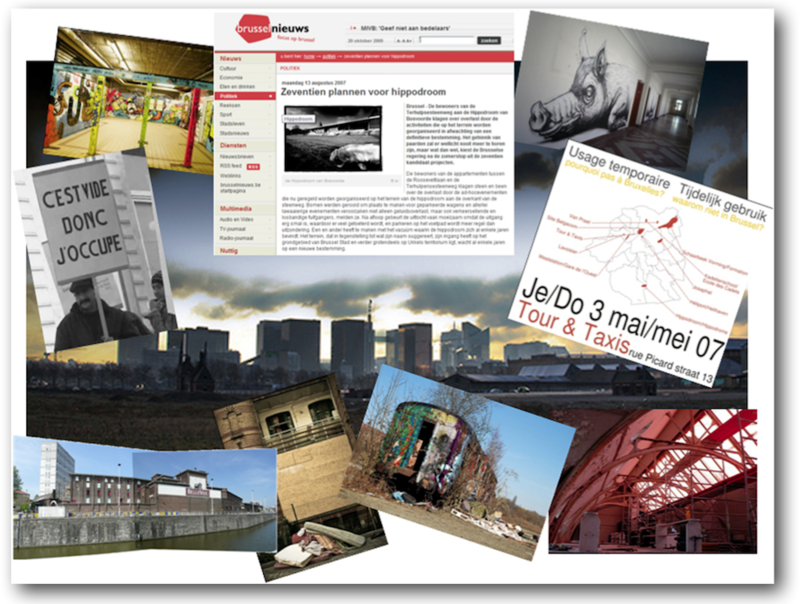 On the other hand, the present situation and existing opportunities for temporary use in the concrete context of the Brussels Capital Region are examined in 10 case studies, dating from 2009 and 2010. The present contribution mainly focuses on this part of the study. Nevertheless the conclusions are based on the complete study, supplemented with the analysis of “exemplary” cases’3 (in which temporary use has been purposefully applied and partnerships between citizens and authorities have been developed). The objective is to put the possible role of temporary use on the agenda of the Region’s urban planning. In this way, the present contribution joins other current initiatives on this issue, such as the organisation of the symposium “Tijdelijke Publieke Ruimte Tussen Flexibiliteit en Planning” and the master class on “De Uitdaging van Tijdelijke Publieke Ruimtes” of the ]pyblik[ platform in September 2013. 6As mentioned above, urban spaces can become “temporarily out of use”. They exist in a sort of interval, a “waiting period” in their functionality. In this study, we therefore define them as “waiting spaces” (in Dutch “pauzelandschappen” or pause landscapes, after de Graaf en Bomas . a future function still has to be determined. In this case the time perspective for temporary use is essentially unlimited. We call this pure “temporary” use, with more freedom in the possible results. the realisation of the future function is delayed for various possible reasons, including planning processes, financial complications or unexpected technical issues. In this case the time perspective for temporary use is limited and “interim use” would be a more appropriate term – possible results are more restricted, as most often plans for the area already exist – although they could sometimes be adapted under the influence of the temporary use. 8A typical example of a waiting space is the “trou des Halles” in Paris. At the end of the Sixties, beginning of the Seventies, this 62 acre site remained vacant after the move of the age-old market of “Les Halles” to the suburb of Rungis. The redevelopment of the area was extremely complicated and quite controversial4. 9Such sites often exude a special atmosphere. They seem to have different rules and are sometimes defined as “heterotopia” [Foucault, 1967] or “terrain vagues” [de Solà-Morales, 1995]. In spite – or precisely because – of their apparent uselessness from the perspective of the current economic space cycle, these areas attract alternative and less evident users. These users however seldom have the power or the financial means to realize their projects in conventional ways, and so have to look for alternative approaches. They have the main advantage of being able to recognize the opportunities of a site and to allow an interaction between their own plans and the characteristics of the space [Overmeyer, 2007]. The uncertain condition of the waiting space however often compels these users to become “temporary users”, frequently forced to “move” when the site they are using is re-integrated in the prevalent space cycle. 10As waiting spaces exist temporarily but are a permanent reality in the city, their temporary use suggests an opportunity for the creation of an ever changing network of alternative urban (public) spaces, almost a parallel city. Farone and Sarti  speak of an “intermittent city”. The (temporary) integration of waiting spaces in this so-called “intermittent city” and their use by alternative and less evident users, can transform these sites in to “testbeds for change” as described by Shane . According to him, these are exceptional fragments of the city, functioning as nodes of difference and change, and can become breeding grounds for urban innovation. This allows solutions to be found where traditional planning strategies have failed. 11In the Brussels Capital Region, this alternative and innovating nature of waiting spaces has already manifested itself in the past. In an issue of L’Information Géographique on “Activisme urbain : art, architecture et espace public” Jamar  and Comhair  describe how, after the emergence in Brussels of the first generation of urban activists in the Seventies, with for instance ARAU (Atelier de recherche et d’action urbaines), in the Nineties a second generation appeared, such as Disturb. According to Jamar  for these second generation activists, vacant urban sites represented both a disgrace (a consequence of the failure of modernist urban planning) and an opportunity. For whereas they all agreed on the revaluation of creativity (in urban development) and the creation of an urban identity (a metropolitan Brussels), these activists were not organized in a single movement and did not really present a unified discourse. In this sense vacant sites offered an interesting working space because they pragmatically enabled various and surprising actions, but still allowed the participants to retain their own background and independence. The temporary occupation of the vacant Hôtel Central (in 1995) is considered a watershed in the emergence of this second generation of urban activists which, like its predecessor, significantly influenced the reorientation of urban policy in Brussels. Their actions and networks resulted in, among others, the propagation of architectural competitions as a method, the organisation of a curriculum on public space, the creation of an Agency for Territorial Development, the appointment of a Brussels Architect, the definition of a procedure for the design of guidance schemes and the establishment of an International Development Plan [Comhair, 2012: 19]. Also several large vacant areas, such as Thurn & Taxis and the Schaerbeek railway sidings, were indicated in the second Regional Development Plan as Leverage Sites [Jamar, 2012: 34]. This shows an effective recognition that such sites can play a role in making the city more attractive. 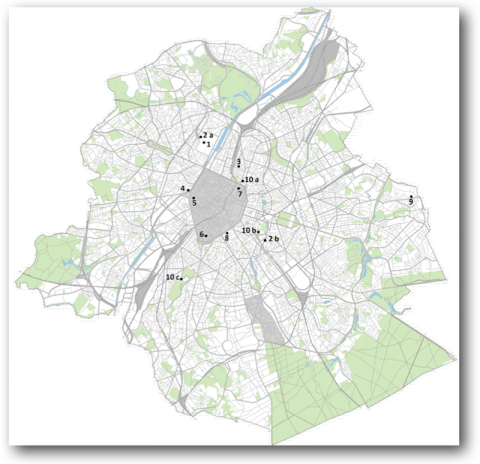 12In order to obtain an overview on the actual state of affairs, at the start of the study (2009) a large range of forms of temporary use of waiting spaces in the Brussels Capital Region was collected and explored. This was done by monitoring local and national press, studying publications on vacancy, questioning actors, field work and research in online picture services and on websites dedicated to vacancy and related issues (such as urban exploration, the exploration and taking pictures of abandoned buildings and structures). 13Based on the criteria of stage, location and type, 10 cases were selected for further study. The cases were selected with the purpose of choosing projects in various development stages (planning stage, early start, developed, finished). In order to study the influence on and of the surroundings, a selection was made of cases distributed through the territory of the Brussels Capital Region. With regard to the functions, cases were selected which could illustrate as fully as possible the existing diversity of the types of temporary use. 15For the in-depth analysis of the selected cases in 2010 various sources were used: document studies (articles, policy documents, papers, publications, etc.) were supplemented with (semi-structured) interviews and field observations. Questionnaires were designed and presented to organisers (and where possible to visitors and neighbours) of the temporary projects. In addition spatial analysis methods were used, including photographic techniques. Whenever possible (in current cases) we tried to supplement these sources with participative observations, allowing us to identify the actors concerned, investigate the determining factors and observe the influence of and on the environment. For the comparison of the cases, two templates were designed: one for the site, the other for its use. 16Using the completed templates, each project was examined according to the same criteria, allowing a comparison on different levels. In the context of this contribution, we focus on how and why the actors concerned opted for temporary use. Based on these data, we can classify the projects studied in three groups. 17Firstly, some actors implement temporary use in a quite pragmatic manner. In these projects, the explicitly declared arguments for temporary use – for instance the revaluation of a neglected site – are often associated with less explicit arguments, such as (city)marketing. This includes the cases Cityscape, Lancelot and Zennestraat 17. 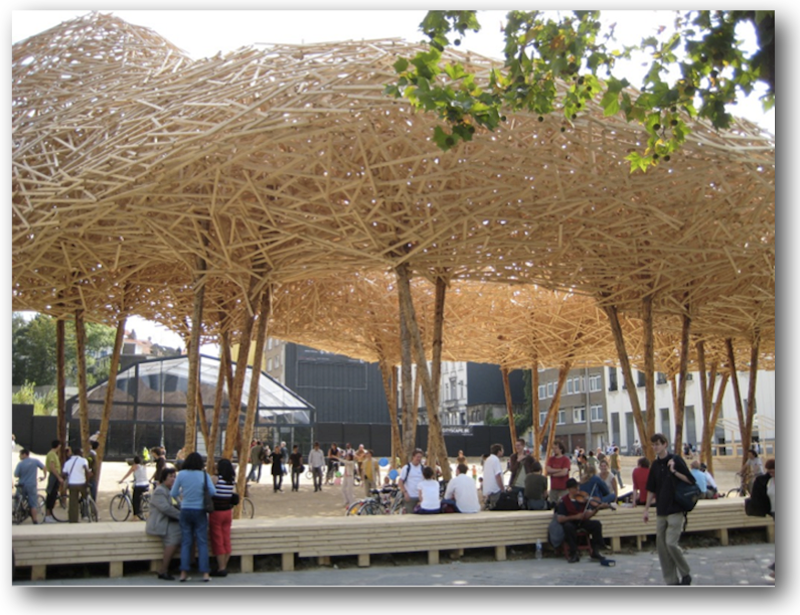 18“Cityscape”5, a work of art by Arne Quinze, created – awaiting the realisation of a new construction project – a more or less public space on a vacant building site on the Avenue de la Toison d’Or. Although the project re-integrated the site in the urban fabric, it should be noted that it was not always accessible for all types of users. One of the reasons was the promotional nature of the project: BMW Mini (BeLux) financed the project and used part of the site for the organisation of trendy promotional events. 19Lancelot is a commercial organisation preserving vacant real estate through temporary occupation. The temporary inhabitants, paying a relatively low rent, have to conform to a number of strict conditions (e.g. no children, no pets, obligatory proof of revenue). They are furthermore subjected to a 2 weeks’ notice period. This makes the project less interesting from a social and urban development perspective. 20The property Zennestraat 17 was loaned during two years by its owner-developer to several Brussels art associations. Although the project resulted in interesting collaborations and networks between the organisations, hardly any relationships with the environment were created. The temporary project anticipated the building’s conversion to lofts. The project did not really challenge this future destination and even in a way contributed to the promotion of the site with the new target public (and to the gentrification of the neighbourhood). 21Secondly, some actors emerged in the urban activism climate of the Nineties and are still active, e.g. City Mine(d) and Cinema Nova. In order to remain a critical and independent attitude, they have adapted their discourse6, without abandoning their trusted methods. Waiting spaces are still part of the sphere of activity of these actors, as illustrated by the cases Limite Limite tower, Actionfields and PleinOPENAir. 22The Limite Limite tower project entailed the construction of a temporary nine meters high tower on a vacant lot in the Schaerbeek Brabant district. From 1999 to 2004 the tower was used as a community space for neighbourhood activities. City Mine(d)’s approach of this project was based on initiating networks between the actors concerned, later to be followed by broader outcomes. The project resulted in the creation of the non-profit organisation “Limiet Limite” a network and forum which after the demolition of the tower contributed to the social and physical development of the neighbourhood7. City Mine(d) still uses the “first step” strategy (stimulating local autonomy) and even now Mine(d) works with vacant sites (for instance in its recent work on the Eggevoort-site in the PUM project: pumproject.wordpress.com). 23The PRECARE project by City Mine(d) – providing studios or working spaces for artistic or social initiatives in vacant buildings – created an alternative exhibition space for young artists called Actionfields, in a commercial property in the Rue Haute. This allowed the gallery owner to gain experience in an affordable way, make connections and build a reputation. Now that the project is more mature, he is looking for a more permanent place of business (possibly at the same location). 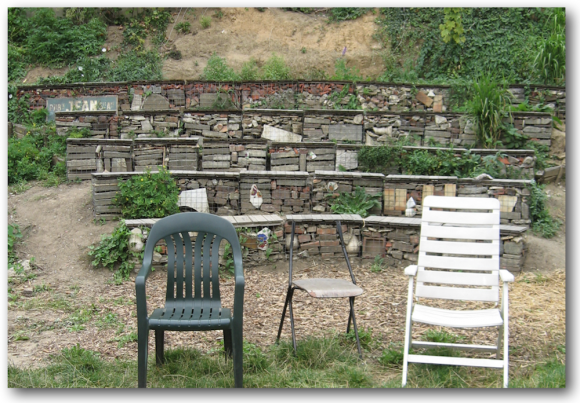 The PRECARE project was terminated at the end of 2009, among other reasons because in the view of City Mine(d) the project’s issue was no longer topical and other claims on the available sites were more deserving (such as the right to housing, a subject we will discuss later on). 24Since 1997 Cinema Nova each year organises the alternative open air film festival PleinOPENAir. The festival offers a combination of movie projections, concerts, site visits and other animations. The locations change from year to year. The annual themes always focus on actual public and/or private urban development issues in Brussels. 25Thirdly, we can distinguish a number of “new”8 actors, who try to respond to the specific contemporary problems confronting the city through the temporary use of waiting spaces. As they do not consider the traditional (top-down) approach to be effective, they organise themselves, using the grassroots energy of the city. In their projects they denounce spatial and social inequality and the bureaucratic manner in which the city is being managed. Their projects often stem from ideological views on the realisation of a “better” city. They are exemplified by the cases of the building playground, the community gardens of Thurn & Taxis and the Rue Gray, the Bellevue brewery and the non-profit organisation Woningen 123 Logement. 26The building playground is organised by Jeugd en Stad Brussel (JES) Brussel on the Thurn & Taxis site, a largely vacant former railway siding near the Brussels canal. In the summer holidays, children (from 8 to 13), supervised by collaborators of JES and animators from the neighbourhood, build a “camp”. The objective of the project is to provide an accessible recreation offer and at the same time alerting the children in a playful way to the existence of a “blind spot” in their neighbourhood. In this way JES wants to involve the children in the future redevelopment of the site. By creating (in various ways) a dialogue between the children and the decision makers and designers (in a participation trajectory led by BRAL), the projects aims to ensure that the plans for the future of the site will take into account their needs and wishes. 27The Thurn & Taxis and Rue Gray community gardens are ecological neighbourhood gardens managed by a cooperative of volunteers, supported by the non-profit organisation Le Début des Haricots. The gardens contribute to the biodiversity of local flora and fauna and act as centres for education on ecology and durable food. In this way the gardeners set an example for their co-inhabitants. The gardens are also a social meeting place for the neighbourhood. 28The neighbourhood and (collective) urban vegetable garden movement has gathered many followers. The government has joined the trend: since 2011 Leefmilieu Brussel structurally supports the development of a “network of vegetable gardens” (cfr. : stadsmoestuinen.be). 29The employment project “ART2WORK”, introducing unskilled and underprivileged youngsters in the employment circuit by means of accompanied work placements in the art sector, first took up temporary residence in the former Bellevue brewery in Molenbeek. At the same time, rooms were rented to creative start-ups, a pub was opened and the educational activities of the citizens’ initiative Platform Kanal were hosted. The temporary period is used for improving the organisation of the project and lobbying for a long term integration in the redevelopment of the building. 30The non-profit organisation Woningen 123 Logement was launched from the idea of “social integration through housing”, for people who are having difficulties (because of financial and other reasons) to find a place to live. Vacant buildings in Brussels are being occupied and made available as alternative and social housing – e.g. the former office building Koningsstraat 123. In its own way, the association offers a – small but very symbolic – contribution to the re-introduction of the residential function in the city. The project broaches the large shortage of affordable housing in the Brussels Region and illustrates a line of reasoning which in this framework could be valuable, namely the reuse of vacant office buildings. 31These examples show that Brussels also indeed has an “intermittent city” [Farone and Sarti, 2008]: a temporary, spontaneous parallel city with a climate of difference and change. Still we consider that this existing energy could be used even better, in a more contemporary, flexible and spontaneous approach to urban development. 32Planners and developers need to realise that waiting spaces can be seen as an opportunity for instead of a threat to the city. Temporary projects on these sites offer countless possibilities for a valuable contribution to urban (re)development. The approach however strongly diverges from case to case. It is therefore inadvisable to overly institutionalise this flexible and ephemeral phenomenon. As no really uniform approach can be formulated, the policy regarding such self-organizing projects will have to adopt a more facilitating posture, with the spontaneity of the city as the starting point for urban development and policy. 33Waiting spaces can offer less established/dominant users opportunities to participate in the life of the city and to influence the way urban space is modelled. This could lead to more dynamic, better integrated projects. More dynamic because alternative users and activities are offered opportunities for inclusion. Better integrated because the base of support for projects becomes broader when local residents participate in and grow with the transformation process. 34Through temporary use, urban (re)development can gradually evolve from experiment to implementation, from temporary to durable development. In this way decisions can be better justified and planners and designers gain more confidence in their confrontation with the current unpredictable and uncertain context. Temporary use therefore allows for an experimental, practical search for solutions when traditional development strategies fail. 35From this point of view, it is important that our cities continue to offer sufficient room for experiments: when an urban space becomes available (even for a limited period of time), the possibility to make the site available for temporary use should be self-evident. Professionals should consider temporary projects as an obvious part of the planning and design process. This will help them to realise that an urban (re)development project does not commence with the start of the works on site, but at the conceptual stage and even at their first encounter with the project area. the creation and maintenance of a Regional “database of waiting spaces”, giving an overview of the available expansion areas. This database could provide information on the geographic location of waiting spaces, their ownership structures, expected vacancy periods, plans for the future and so on. It should be designed as a flexible (often and easily updatable) and interactive (also adaptable by the users) instrument. Mapping these data will reveal the “intermittent city” we have described, illustrating urban transformation spaces which are usually absent from maps or appear as indeterminate spaces. By taking these sites (and their users) in account in the design of visions for the future of the city, policy makers and planners can manage the urban space in a more anticipating manner. As a matter of fact, these sites are pre-eminently suited for the initiation and testing of durable, inclusive and future oriented urban transitions. the creation of an “office for temporary use” compiling and distributing experiences and knowledge from various temporary projects. In its most basic form, the office could consist of a web page providing various types of useful information about temporary use (in analogy with or building on the website of the terminated project “PRECARE” of City Mine(d) -www.precare.org). This office could also become a true point of contact, providing guidance for the creation of temporary projects, for instance by helping to find the proprietors of a given site, associating the various actors and stakeholders and assisting in the various procedures of planning permission applications (analogous to the coordination cell created in Berlin for the “Neuland” project and the Meanwhile Space CIC, created in the framework of the British “Meanwhile” project – cfr. : www.neuland-berlin.org and www.meanwhilespace.com). the creation and support of a “department for (the study of) Temporary Development”, dedicated to: detecting, coordinating and organizing temporary projects aimed at future (re)developments in the city (analogous to the Groot en Verdurmen consulting agency “Department Tijdelijke Ordening” in Arnhem: cfr. www.dto.nu/dto-trigger.html). This department, which could be independent or integrated in for instance the administration for urban planning and housing of the Region, would monitor the city’s waiting spaces and act in a coordinating role, supervising the individual projects of the various initiators (Meanwhile Space CIC employs a similar function – cfr. : www.meanwhilespace.com). The results can be collected in the database of waiting spaces and the office for temporary use. This study team should have an interdisciplinary composition, allowing it to look at the city from various perspectives. These insights enables the design of a true “urban project” which takes into account the (demographic, economic, ecologic, technologic…) changes and adapts to these evolutions by using the available waiting spaces in the city. government support for temporary projects. It should be noted that, apart from financial subsidies, other (and often better) supporting measures are possible. For example: the systematic provision at low cost of government sites and buildings in a waiting stage, the provision of materials and knowledge (e.g. by appointing a person who facilitates the legal/administrative aspects of temporary projects, eventually through the interval office) and/or the flexible handling of regulations for temporary projects (e.g. by providing emergency procedures, temporary planning permissions or even temporary exemptions from urban planning regulations). In this context additional research is needed regarding existing (urban planning) instruments which could be used or adapted in order to facilitate urban redevelopment through temporary use. ATELIER VERBORGEN LAND, 2004. Tussenland. Rotterdam: Nai publishers. BOELENS, L., 2010. Theorizing Practice and Practising Theory: Outlines for an Actor-Relational-Approach in Planning. In: Planning Theory. 2010. Vol. 9, No. 1, pp. 28‑62. BOMAS, B. and DE GRAAF, J., 2005. In de Tussentijd. Wageningen: Stichting Lijn in Landschap. CHATTERTON, P., 2010. The urban impossible: A eulogy for the unfinished city. In: City. 2010. Vol. 14, No. 3, pp. 234‑244. COMHAIR, G., 2012. Activisme urbain et politiques architecturales à Bruxelles: le tournant générationnel, In: L’Information géographique. 2012. Vol. 76, No. 3, pp. 9‑23. D.EFAC.TO stedenbouw, 2011. Tijdelijk Anders Bestemmen, inspiration book commissioned by Tijdelijk Anders Bestemmen, an initiative of: Rijkswaterstaat, InnovatieNetwerk, Deltares and CURNET. DE SOLÀ-MORALES RUBIO, I., 1995. Terrain Vague. In: DAVIDSON, C., Anyplace. Cambridge: MIT Press, pp. 118‑123. FARONE, C. and SARTI, A., 2008. Intermittent Cities, On waiting Spaces and how to Inhabit Transforming Cities. In: Architectural Design. 2008. Vol. 78, No. 1, pp. 40‑45. JAMAR, D., 2012. Art-Activisme: enjeux de créativité urbaine à Bruxelles. In: L’Information géographique. 2012. Vol. 76, No. 3, pp. 24‑35. KERSTEN, P., 2004. Onacceptabele leegstand. In: Rooilijn, tijdschrift voor wetenschap en beleid in de ruimtelijke ordening. 2004. Vol. 37, No. 9, pp. 426‑431. LINDEMANN, S. and SCHUTTEN, I., 2010. Stedelijke transformatie in de tussentijd. Hotel Transvaal als impuls voor de wijk. Haarlem: SUN/Trancity. OVERMEYER, K., 2007. Urban Pioneers: Berlin: Stadtentwicklung Durch Zwischennutzung. Berln: jovis Verlag. SHANE, D., 2005. Recombinant Urbanism: Conceptual Modeling In: Architecture, Urban Design and City Theory. Chichester, West Sussex: Wiley Academy Press. ROTTERDAM and VUB BRUSSEL, 2004. De Schaduwstad, vrijplaatsen in Brussel en Rotterdam. Rotterdam: Urban Unlimited. 1 PhD study financed by the Brussels Instituut voor Onderzoek en Innovatie (INNOVIRIS) in the Prospective Research for Brussels programme 2008 - promotor: Bruno De Meulder (K.U. Leuven), copromotor: Kees Doevendans (Sint-Lucas Architectuur). 4 see for instance MALLET, Françoise, 1967. Le Quartier des Halles de Paris. Etude d’un héritage millénaire. Observations sur l’évolution des fonctions urbaines. In: Annales de Géographie. 1967. Vol. 76, No. 413, pp. 1‑28. 5 the work of art created an awning covering a public space, awaiting the realisation of a new construction project, postponed by neighbourhood protests against the scheme. 8 The actors are not necessarily newcomers on the Brussels activist scene (e.g. Wim Embrechts of ART2WORK has been active with Recyclart) but their organisation methods and motivations (the issues they focus on) have changed from the past. Architect and urban planner Aurelie de Smet is presently working at the Architecture Department Sint-Lucas of the Katholiek Universiteit Leuven on an PhD thesis examining how the temporary use of urban “waiting spaces” could contribute to a more contemporary, flexible and spontaneous approach to urban development. Publications of the author on this subject include “Gaten in de stad zijn kansen voor de stad” (Ruimte, 2010‑6).